SCHOOL students across the Whitsundays have been singing their little hearts out in rehearsal for the 2017 Carols by the Beach Christmas concert. A huge crowd is expected to gather on the Airlie Beach foreshore on Sunday for an event which has become a Whitsunday institution in the lead-up to Christmas. Hosted by the Rotary Club of Airlie Beach, the event, which offers something for everyone regardless of age, has proved immensely popular year after year. Families are invited to bring their picnic rugs and camping chairs and settle in for a night of Christmas cheer from 5-8pm. Santa will arrive at about 7pm, giving many Whitsunday children their first taste of the festive season. Children are encouraged to wear festive costumes as there will be a dress up competition for both girls and boys. The Proserpine Citizens Band will take the lead and will be supported on stage by the students of Meryn Hall and Sophie Wellard from St Catherine's Catholic College. Fresh from their performance of the Lion King Junior, the children from Cannonvale State School will take the stage to perform everybody's favourite Christmas carols led by choir conductor Jennifer Renton. The tradition of Airlie Beach Carols by the Beach has been running for 24 years and Rotary has taken the lead for the last 10, Ms McErlane said. "It goes without saying that I am so excited about the carols,” she said. There will be ice cream, coffee, fairy floss and glow-sticks available to purchase at the Airlie foreshore on Sunday and if it rains the event will be moved to the multi-purpose hall at Cannonvale State School. 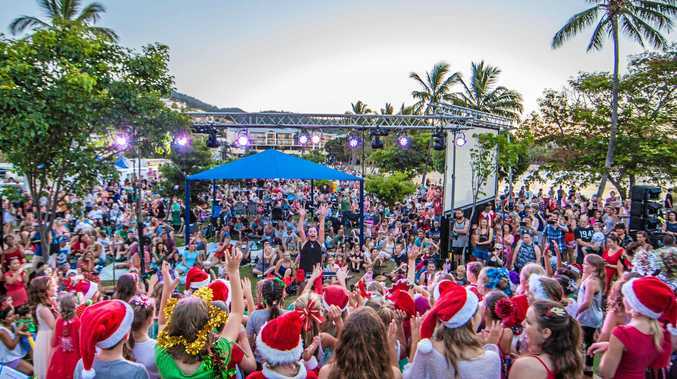 Carols by the Beach is a free community event for the Whitsunday region. Come along and sing your favourite Christmas carols performed by local schools and community groups.